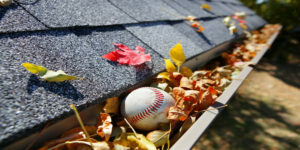 » Smart Roofing, Inc. – Proper Gutter Maintenance SMART Roofing Inc: Chicago Roofing Contractor, Roof Repair, Installation, Hail Damage, Hail Storm Damage Smart Roofing, Inc. – Proper Gutter Maintenance Roofing Contractor - SMART Roofing Inc: Roof Repair, Installation, Hail Damage, Hail Storm Damage. Proper gutter maintenance is the #1 way to prevent expensive water damage to your home. Gutters are designed to do one thing — channel water away from the foundation — and they’re critical to protecting the structural integrity of your house. However, in order for gutters to do their job properly, they need to be maintained property, and have to be kept free of clogs, holes, and sags. Clogged Gutters – This is the most common problem of all. Left untended, gutters and downspouts get so clogged with debris that they’re rendered useless. The excess weight of leaves, twigs, and standing water can also make them sag and pull away from the fascia. Clean them at least once a year, and twice a year if you have a lot of trees nearby. Sagging Gutters – This is usually a problem with the hangers, the hardware that secures the gutters to the fascia. They might have deteriorated over time, the fasteners may have backed out of the wood, or they’re spaced too far apart to support the weight of full gutters. The cost to fix it yourself is cheap; hangers generally cost $10 or less apiece, and the fasteners run about $1 each. Leaks and Holes – Leaks in gutter joints can be sealed by caulking the joint from the inside with gutter sealant. A tube costs about $5. Very small holes can be filled with gutter sealant. Larger holes will require a patch. Downspouts Draining Too Close to the Foundation – Downspouts need to extend several feet from the house, or they’ll dump right into the basement. Gutter extensions attached to the bottom of the downspout will discharge water well beyond the foundation. They’re inexpensive and easy to install. Contact Smart Roofing, Inc. at 847.797.0404 or or email contactus@smartroofers.com for all of your residential and commercial roofing and gutter needs! This entry was posted in News, Warnings and tagged Algonquin Gutter Damage, Algonquin Roof Leaking, Antioch Gutter Damage, Antioch Roof Leaking, Arlington Heights Gutter Damage, Arlington Heights Roof Leaking, Aurora Gutter Damage, Aurora Roof Leaking, Barrington Gutter Damage, Barrington Hills Gutter Damage, Barrington Hills Roof Leaking, Barrington Roof Leaking, Bartlet Gutter Damage, Bartlet Roof Leaking, Batavia Gutter Damage, Batavia Roof Leaking, Bedford Park Gutter Damage, Bedford Park Roof Leaking, Bensenville Gutter Damage, Bensenville Roof Leaking, Berwyn Gutter Damage, Berwyn Roof Leaking, Bridgeview Gutter Damage, Bridgeview Roof Leaking, Broadview Gutter Damage, Broadview Roof Leaking, Brookfield Gutter Damage, Brookfield Roof Leaking, Buffalo Grove Gutter Damage, Buffalo Grove Roof Leaking, Burr Ridge Gutter Damage, Burr Ridge Roof Leaking, Chicago Gutter Damage, Chicago Heights Gutter Damage, Chicago Heights Roof Leaking, Chicago North Shore Gutter Damage, Chicago North Shore Roof Leaking, Chicago Northwest Suburbs Gutter Damage, Chicago Northwest Suburbs Roof Leaking, Chicago Roof Leaking, Chicago Suburbs Gutter Damage, Chicago Suburbs Roof Leaking, Cicero Gutter Damage, Cicero Roof Leaking, Country Club Hills Gutter Damage, Country Club Hills Roof Leaking, Countrysie Gutter Damage, Countrysie Roof Leaking, Crestwood Gutter Damage, Crestwood Roof Leaking, Crystal Lake Gutter Damage, Crystal Lake Roof Leaking, Deer Park Gutter Damage, Deer Park Roof Leaking, Deerfield Gutter Damage, Deerfield Roof Leaking, Des Plaines Gutter Damage, Des Plaines Roof Leaking, Dundee Gutter Damage, Dundee Roof Leaking, Elgin Gutter Damage, Elgin Roof Leaking, Elk Grove Village Gutter Damage, Elk Grove Village Roof Leaking, Elmhurst Gutter Damage, Elmhurst Roof Leaking, Elmwood Park Gutter Damage, Elmwood Park Roof Leaking, Evanston Gutter Damage, Evanston Roof Leaking, Evergreen Park Gutter Damage, Evergreen Park Roof Leaking, Forest Park Gutter Damage, Forest Park Roof Leaking, Franklin Park Gutter Damage, Franklin Park Roof Leaking, Glenview Gutter Damage, Glenview Roof Leaking, Highland Park Gutter Damage, Highland Park Roof Leaking, Huntley Gutter Damage, Huntley Roof Leaking, Indian Head Park Gutter Damage, Indian Head Park Roof Leaking, Inverness Gutter Damage, Inverness Roof Leaking, Itasca Gutter Damage, Itasca Roof Leaking, La Grange Gutter Damage, La Grange Roof Leaking, Lake Barrington Shores Gutter Damage, Lake Barrington Shores Roof Leaking, Lake Forest Gutter Damage, Lake Forest Roof Leaking, Lake in the Hills Gutter Damage, Lake in the Hills Roof Leaking, Lake Villa Gutter Damage, Lake Villa Roof Leaking, Lake Zurich Gutter Damage, Lake Zurich Roof Leaking, Lemont Gutter Damage, Lemont Roof Leaking, Libertyville Gutter Damage, Libertyville Roof Leaking, Lincolnwood Gutter Damage, Lincolnwood Roof Leaking, Long Grove Gutter Damage, Long Grove Roof Leaking, Lyons Gutter Damage, Lyons Roof Leaking, Maine Township Gutter Damage, Maine Township Roof Leaking, Melrose Park Gutter Damage, Melrose Park Roof Leaking, Morton Grove Gutter Damage, Morton Grove Roof Leaking, Mount Prospect Gutter Damage, Mount Prospect Roof Leaking, Naperville Gutter Damage, Naperville Roof Leaking, Niles Gutter Damage, Niles Roof Leaking, North Lake Gutter Damage, North Lake Roof Leaking, North Shore Gutter Damage, North Shore Roof Leaking, Northbrook Gutter Damage, Northbrook Roof Leaking, Northfield Gutter Damage, Northfield Roof Leaking, Oak Forest Gutter Damage, Oak Forest Roof Leaking, Oak Lawn Gutter Damage, Oak Lawn Roof Leaking, Oak Park Gutter Damage, Oak Park Roof Leaking, Palatine Gutter Damage, Palatine Roof Leaking, Palos Gutter Damage, Palos Roof Leaking, Park Forest Gutter Damage, Park Forest Roof Leaking, Park Ridge Gutter Damage, Park Ridge Roof Leaking, River Forest Gutter Damage, River Forest Roof Leaking, Riverside Gutter Damage, Riverside Roof Leaking, Rolling Meadows Gutter Damage, Rolling Meadows Roof Leaking, Roselle Gutter Damage, Roselle Roof Leaking, Rosemont Gutter Damage, Rosemont Roof Leaking, Schaumburg Gutter Damage, Schaumburg Roof Leaking, Schiller Park Gutter Damage, Schiller Park Roof Leaking, Skokie Gutter Damage, Skokie Roof Leaking, South Barrington Gutter Damage, South Barrington Roof Leaking, St. Charles Gutter Damage, St. Charles Roof Leaking, Streamwood Gutter Damage, Streamwood Roof Leaking, Sugar Grove Gutter Damage, Sugar Grove Roof Leaking, Tinley Park Gutter Damage, Tinley Park Roof Leaking, Vernon Hills Gutter Damage, Vernon Hills Roof Leaking, Westchester Gutter Damage, Westchester Roof Leaking, Western Springs Gutter Damage, Western Springs Roof Leaking, Wheeling Gutter Damage, Wheeling Roof Leaking, Willow Springs Gutter Damage, Willow Springs Roof Leaking, Wilmette Gutter Damage, Wilmette Roof Leaking, Winnetka Gutter Damage, Winnetka Roof Leaking, Wood Dale Gutter Damage, Wood Dale Roof Leaking, Woodridge Gutter Damage, Woodridge Roof Leaking. Bookmark the permalink.